The Safe Spaces Initiative (SSI) took initiative to increase student awareness about safe spaces and similar resources on campus. Students on campus were surveyed and interviewed to create a UC Davis Safe Spaces map, video, and website to further provide students and understanding of safe spaces and where they might be on campus. The questions asked regarded what they thought a safe space was, why safe spaces on campus were important, what they considered as safe spaces, and what their go-to safe spaces on campus were. The UC Davis Safe Spaces Initiative aims to address the importance of safe spaces for not only students, but anyone within the UC Davis community and the Davis community in general. A safe space is a place or environment in which people can feel both comfortable and safe to be whom they are, and it is a space free from criticism, harassment, discrimination, and other forms of harm. 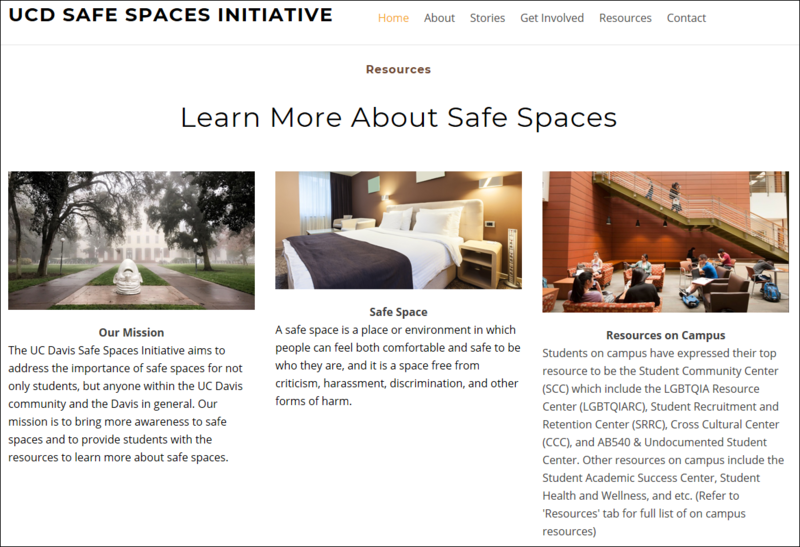 A screenshot of the UC Davis Safe Spaces Initiative website! A screenshot of the different resources and Safe Spaces on google maps! 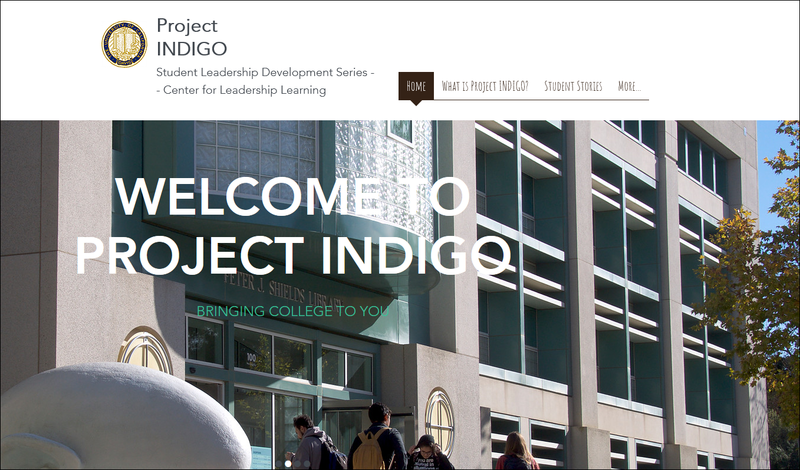 Project INDIGO is an online resource dedicated to providing students from disadvantaged backgrounds to pursue higher education. The website is a snapshot of what life is like on a college campus which hopes to inspire younger students to think about pursuing high education. It features stories from both undergraduate and graduate students at UC Davis, fun videos of students’ days at college, college pathways available (Community College, 4-year college), career pathway and UC Davis resources. Project Indigo hopes that this website is able to motivate students, especially from underserved communities who may not have access to these resources, to look into higher education. A screenshot of Project Indigo's page! As a team of three, “JPX Hygiene” worked to promote hygiene awareness and accessibility in the community. To achieve this vision, they did this by asking potential donors from Sacramento to the Bay Area for item donations such as toothbrushes, toothpastes, soaps, shampoos, conditioners, etc. Surprisingly, they surpassed their goal of 500 items by 4 times, which was a total of over 2,000 items. JPX Hygiene gathered donations of hygiene products and assembled them into kits. The group also made an educational brochure about the importance of personal hygiene in daily life in both English and Spanish. They distributed 450 fully assembled hygiene kits and brochures to local clinics and shelters in the community. They donated approximately 1300 individual items to the UC Davis pantry. Local hospital, dentists, and hotels supported them through their kind donations which made it possible for the successful run on their group project. With increased tension on campus, as a result of the 2016 Presidential election results, the Leadership Learning Collective (LLC) came together to promote dialogue between different ideological backgrounds. In order to do so, the LLC developed a 3-step approach. First, they gathered community input through an online, opinion survey. And in an attempt to remain neutral, survey questions were based on the UC Davis Principals of Community. Next, a timeline of controversial events that occurred on and around campus was compiled using the California Aggie as a main source. Lastly, an event was created to showcase the research results and promote dialogue. With their mission in mind, different clubs were invited to attend the event including; Davis College Democrats, Davis College Republicans, and other politically based organizations and individuals. Overall, 38 individuals from different ideological backgrounds attended the hour and a half long presentation where differences were highlighted and celebrated. As a result of this project, the LLC will be working with Vice Provost & Dean, Caroline Thomas to continue efforts to promote dialogue, reduce tension, and improve the overall undergraduate education-learning environment. As a team of three, ALTernative Foods aimed to ensure that the international student community was being served well by the Dining Commons. This group collected information from Service for International Scholars and Students, analyzed the background of international student bodies and provided food for international students to compare with dining hall food. Twenty students (fifteen international and five domestic) attended and gave feedback ranging from how the food tasted to responding to if the Dining Commons should serve this food. Following this, they put together graphs of commonalities of answers regarding where the students were from, how well they liked the food, and how many recommended that the dining hall serves this. In the end, the team presented results to the dining hall director and chiefs. The Dining Commons were happy to hear the information and were willing to make changes to their menu based on this team’s group project! This team of three took a step forward to change the view of edible plants, especially among the students. The group uses information about cultivating edible plants and food through an interactive pamphlet to facilitate the gap between nature and everyday lives. Their goal is to educate the Davis campus and community about the physical, mental, and recreational benefits of having edible plants at home. The group created a pamphlet that uses knowledge about edible plants and engages the audience through word puzzles, fun facts, recipes, testimonial, and resources to get edible plants. They have partnered with the Edible Landscaping Internship from the Arboretum and Public Gardens to further educate the public in the future. Group M.A.Y’s mission was to create a resource platform for those new to Davis to enjoy outdoor activities that Davis has to offer. Not only did they want to promote activities outside, but they also wanted to build an interactive community where students can talk to each other (via their poster) about the places they’ve been, they suggest, or reviewed. A list of suggested parks, campsites, and hiking trails were compiled through online research onto a comprehensive map. M.A.Y. got in contact with Student Housing and the Global Study Center in order to have the map presented in the years to come. As a group of three, the group M.A.Y took initiative to offer accessible options about outdoor activities for freshmen at UC Davis, in order to help them become more involved in student life in a new environment. After publishing 5 mock posters and collecting the feedbacks, they built a bridge between UC Davis Student Housing and CLL, where the former agree to post their interaction map on Student Housing bulletin boards year by year. As a team of three, Nutrition Nerds took the initiative to create pinpointed videos to educate and raise awareness of the importance of nutrition and the effects it can have on one’s health. The Nutrition Nerds created a short survey of 12 questions and distributed it to the Davis community to gauge the nutritional education of the community. They collected 126 responses that ranged from different Davis community members. Based on this survey, the team created videos that identified the risks of the populations’ health based on their knowledge of nutrition and educated on ways to increase awareness of nutrition to ultimately optimize health. The videos are housed on YouTube and available through the Student Health and Counseling Services’ Nutrition Services page. As a group of soon to be graduate seniors, this group thought about their time at Davis, and what they could have done to improve their experiences here. The Senioritis team believed that a more fluent resource than the UC Davis pages is needed for the students and prospective students as many of the resources listed were not found by them until they did this project. Their team researched different campus clubs, research opportunities, and professional experience openings and compiled them into a student friendly website. It showcases all the research, internship, and club/organizations on campus that would fulfill their desire to share experiences and breed further participation. The website, Aggie Shortcuts, is open for both undergraduate and graduate students which gives them an avenue to be involved in various activities UCD has to offer. It has garnered a lot of attention and has been picked up by lower division computer science majors! 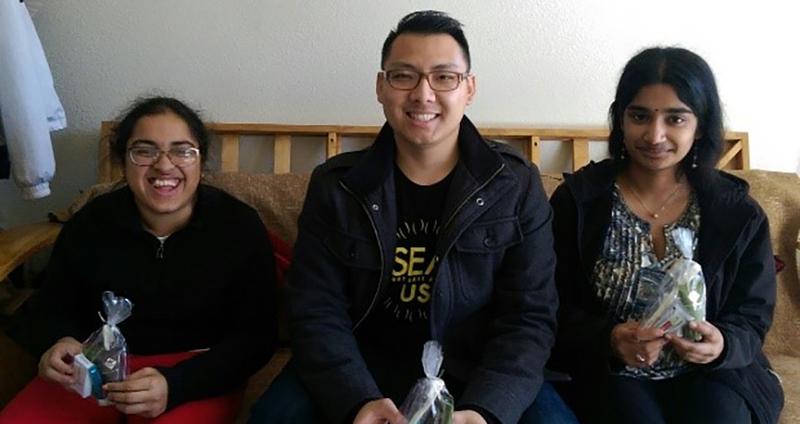 As a group of three members, Triforce Triple Delta’s project was a brochure targeted towards student leaders in student clubs at UC Davis to raise awareness of the resources available through the campus. They were motivated to do this project when they found that many student leaders have no training or knowledge in communication or leadership styles or even basic experience in dealing with the social components of being in a working group. The group did interviews with the CSI to find out about their organization and what they offer to the student clubs in the UC Davis Campus. Their created brochure was emailed to the Center for leadership learning and the Center for Student involvement.